“Wheresoever you may be, death will overtake you even if you are in fortresses built up strong and high!” And if some good reaches them, they say, “This is from Allah,” but if some evil befalls them, they say, “This is from you (O Muhammad صلى الله عليه وسلم).” Say: “All things are from Allah,” so what is wrong with these people that they fail to understand any word? It is He Who gives life and causes death. And when He decides upon a thing He says to it only: “Be!” – and it is. And certainly We! We it is Who give life, and cause death, and We are the Inheritors. La ilaha illa Huwa (none has the right to be worshipped but He). It is He Who gives life and causes death- your Lord and the Lord of your forefathers. He is the Irresistible, (Supreme) over His slaves, and He sends guardians (angels guarding and writing all of one’s good and bad deeds) over you, until when death approaches one of you, Our Messengers (angel of death and his assistants) take his soul, and they never neglect their duty. They indeed are losers who denied their Meeting with Allah, until all of a sudden, the Hour (signs of death) is on them, and they say: “Alas for us that we gave no thought to it,” while they will bear their burdens on their backs; and evil indeed are the burdens that they will bear! Those who deny the Book (this Qur’an), and that with which We sent Our Messengers (i.e. 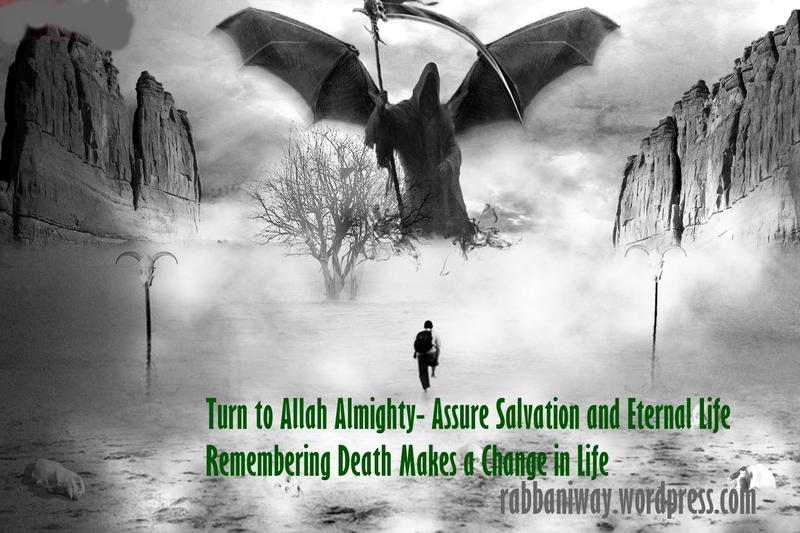 to worship none but Allah Alone sincerely, and to reject all false deities and to confess resurrection after the death for recompense) they will come to know (when they will be cast into the Fire of Hell). Or do those who earn evil deeds think that We shall hold them equal with those who believe (in the Oneness of Allah – Islamic Monotheism) and do righteous good deeds, in their present life and after their death? Worst is the judgement that they make. Verily, those who say: “Our Lord is Allah (Alone),” and then they stand firm, on them the angels will descend (at the time of their death) (saying): “Fear not, nor grieve! But receive the glad tidings of Paradise which you have been promised!